The name of the Longest Night service comes from the season – Saturday marks the Winter Solstice, the longest night of the year. 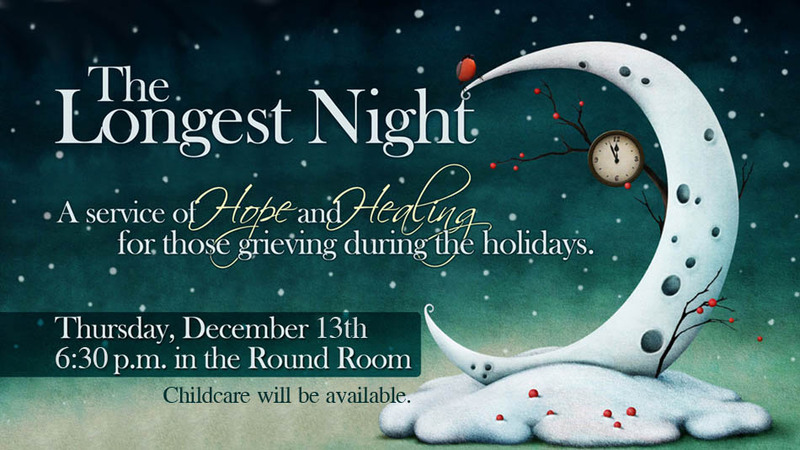 But the name, “Longest Night”, also describes the feeling many of us have during this season. The long, dark winter nights, memories of past experiences and situations can become overwhelming. Job loss, health issues, the end of a relationship, the death of a loved one, all of these things can turn this season into a time of pain with a magnified sense of loss. In this service, we invite you to listen. We invite you to pray. We invite you to sing. We invite you to meditate upon the pain and anguish you may bring - and we invite you to offer your pain to the Christ Child. And we trust that you will find hope and comfort in knowing you are not alone.